Even though trailers can’t be driven on their own, they are some of the most useful vehicles. Trailer transport is one of commonly used specialized auto shipping services. When you need to move your trailer across the country, it does not mean you have to haul it yourself, just use trailer shipping instead. 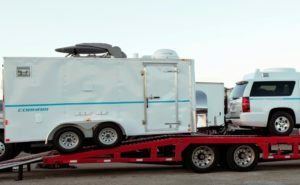 Sizes of various types of trailers vary greatly, so make sure to look for an auto shipping company that can work with the exact make and model of a trailer that you have. Reliable trailer shipping services save you time and money, as well as a lot of stress of having to drive across the country. At Colorado Springs Car Transport we will be happy to work with any kind of trailer you have and safely ship it door to door. Trailer house is an affordable and mobile alternative to a regular house or apartment. In this kind of trailer you can feel like home anywhere. And if you are planning to move, let us take care of moving your mobile home! Cargo trailers are your helpers when you need to move some tools, equipment or any other items. And when you need to move a cargo trailer, our Colorado Springs Trailer Transport services will be very helpful for you. Solar trailers are often used at construction sites, as well as in other places where a mobile source of energy is needed. Need to ship a solar trailer or several of them? Colorado Springs Car Transport is at your service. We also ship many other kinds of trailers. Get more info and request a free quote by calling us or filling out a form on our website. We are looking forward to doing trailer shipping for you! We can also assist you with Van Shipping, Motorcycle Transport and many other services.